Arabic is a shockingly popular language. It’s the official language of most Arab countries. That includes approximately 1.8 billion people. It’s also one of the six official languages of the United Nations. It’s no surprise that people want to learn it. There are a variety of methods to learn it. Some of them are Android apps and some of them are pretty decent. We can help you pick the right ones. 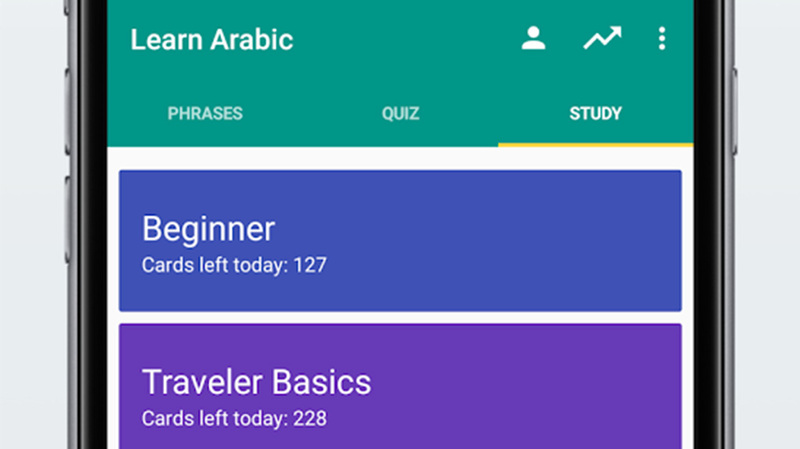 Let’s take a look at the best Arabic learning apps for Android! 5 best English to Arabic dictionaries and phrasebooks for Android! Busuu is a popular language learning app with a bunch of languages. Arabic is one of them. The app has a community style with a lot of traditional and new age teaching methods. That includes short, repeatable lessons for memorization and accent training as well. You get conversational Arabic, vocabulary and grammar lessons, help from native speakers, and offline support. The app has the occasional hiccup or issue. However, it's usually nothing too bad. The price above may seem like quite a lot, but it averages out to just under $6 per month and that's competitive for the other prices on the list. Drops: Learn Arabic is one of the newer Arabic learning apps. It focuses on fast, short sessions and conversational Arabic training. It actually doesn't teach much grammar. You learn words, phrases, and conversations. The grammar just sort of happens along the way. It's a very straightforward and aggressive learning style. The free version limits your usage to five minutes per day. You can bypass that with the premium version. It's quite good, and the free version is adequate for casual learners. Duolingo is one of the most popular free Arabic learning apps. It uses a fairly simple and quick approach to learning. The focus is on things like vocabulary terms, audio pronunciations, and little memory games. Thus, Duolingo tries to make learning the language fun. It seems to work, though, as 34 hours in the app apparently equals a semester in college. The app also includes things like daily challenges to keep people engaged. It's entirely free with no in-app purchases. We're calling our shot a little bit here. Duolingo should have Arabic sometime later in early to mid-2019. Google Translate is a powerful app for travelers and language scholars alike. There are three main features in the app. The first is a text translator that works in 103 language online and 59 languages offline. You can also point your camera at stuff and the app translates things that it sees. This works great for menus and road signs. Finally, you can actually talk to Google Translate and it translates what you say to other languages. That third feature is an excellent tool for practicing. The app is free and everybody learning a new language should have it. HelloTalk is an interesting and unique language learning app. It works a bit like a social media site. You create a profile, meet people, and that's how you learn a new language. It supports over 100 languages currently and that includes Arabic. You log in, pair up with someone, teach them your language, and they teach you theirs. It's a neat experience. However, we don't think this will get you all the way there on its own. We recommend using this as a secondary source of study along with something a little more traditional like Memrise, Rosetta Stone, or Duolingo. Memrise is one of the most powerful and popular language learning apps. It supports dozens of languages, and that includes Arabic. Memrise has a broad approach to learning Arabic. That includes the usual, traditional stuff like vocabulary and grammar lessons as well as a pronunciation guide, community learning, conversational Arabic, and more. It even works offline. It's a tad expensive for the subscription. However, this is a very serious app for serious learners. Mondly is a lot like Memrise. It's huge, supports tons of languages (including Arabic), and it has a lot of tools for learning. Mondly focuses heavily on conversational Arabic and building a grammar and vocabulary base from there. It also includes learning stats, a leaderboard for motivational purposes, phrase learning, and much more. It's quite expensive, much like Memrise. However, the two have different philosophies when it comes to teaching. It might work for you or it might not. It depends on your learning style. Rosetta Stone is a big name in language learning software. It's almost 30 years old at this point. It takes a more traditional approach. That includes word association, conversational Arabic, and even some grammar. It starts out with some basic vocabulary and grammar and gradually grows to include conversations. It's an effective method even if it's more traditional than most. It's also one of the most expensive apps on the list. However, you can pay for it once and avoid any further subscription costs and we like that. Simply Learn Arabic is one of the simplest Arabic learning apps. It works mostly as a phrasebook of sorts. The premium version of the app includes over 1,000 common words and phrases. The free version has around 300 or so. You also get quizzes, audio pronunciations, and support for flashcards. This works best as a secondary study aid and not as a primary source. We recommend using something like this along with something like Duolingo (when it becomes available in Arabic) for a good one-two punch. Tandem is a lot like HelloTalk. It's a community app with a ton of people learning new languages. You pair with one and teach them your language. They teach you theirs in return. The app supports audio and video calls along with text, picture, and audio messages. Tandem also offers tutors and topic selection as well. Like HelloTalk, we recommend this as a secondary source of learning. It may be a bit intimidating for people new to the language learning thing. Otherwise, this and HelloTalk are both fantastic. If we missed any great Arabic learning apps for Android, tell us about them in the comments below! You can also click here to check out our latest Android app and game lists!